Flooded neighborhood in New Orleans. 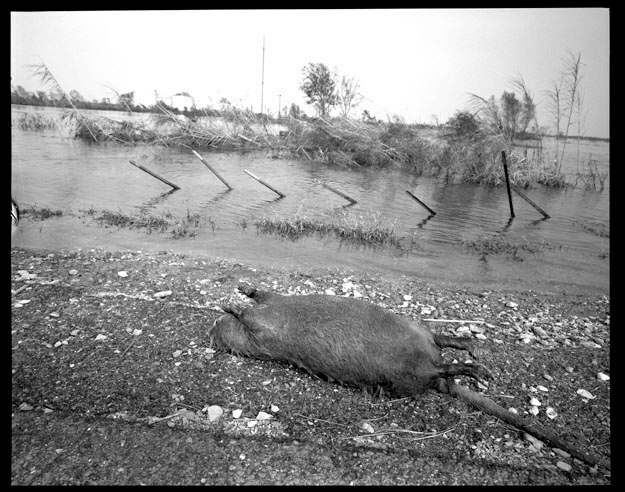 Dead muskrat in flooded area in Cameron Parish Louisiana, September 27, 2005. Starving dog rescued from highway in New Orleans and taken to a shelter. 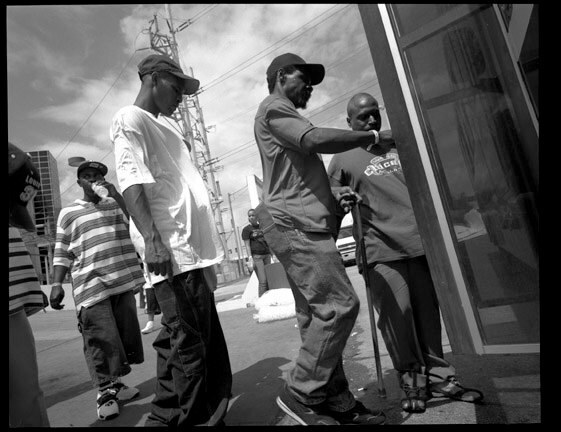 Evacuees from New Orleans board a bus outside the Astrodome in Houston to get new identification papers. Family outside the Astrodome in Houston. The woman was rescued from her flooded home by her boyfriend who came looking for her in an upside down phone booth used as a makeshift raft. She was separated from her oldest son, 13, who was taken to a shelter in Georgia. Worker for Andersen Pollution Control cleans up oil spill at Valero facility in Port Arthur, Texas, September 27, 2005. National Guard patrol flooded neighborhood in New Orleans. The National Guard wore face masks to protect against the stench from the fetid, toxic water. 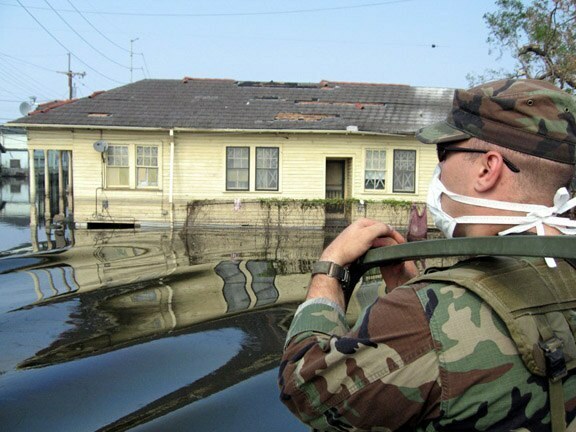 Steve Marcotte, a volunteer for FEMA from the San Francisco Fire Department, gives a tetnis shot to Dwayne Nuewnez, a resident of the town of Newnez in Cameron Parish, Louisiana on September 27, 2005. 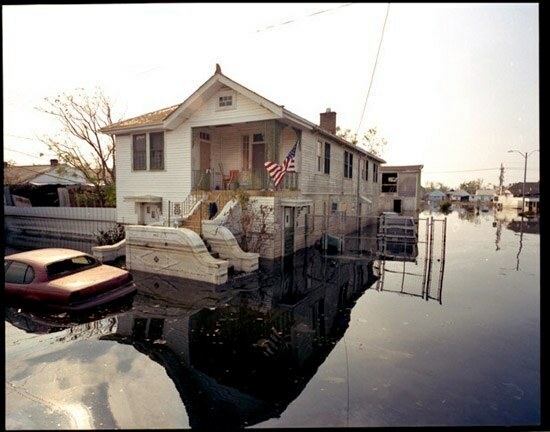 Submerged house in Cameron Parish Louisiana, September 27, 2005. Helicopters with 82nd Airborne fly over flooded area in Cameron Parish Louisiana surveying the damage, September 27, 2005. 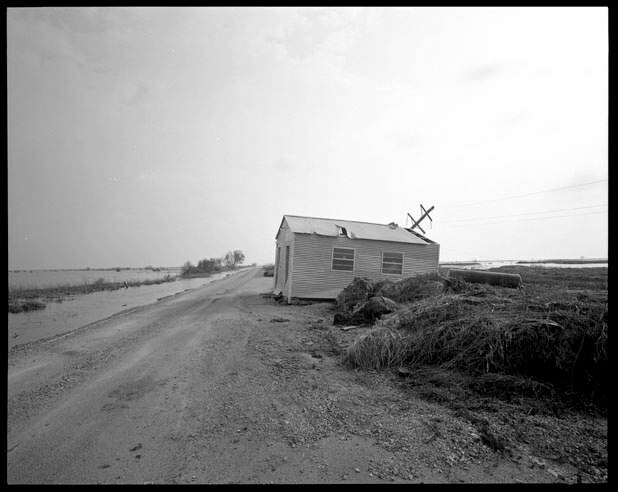 House pushed across a road by storm surge in Cameron Parish Louisiana, September 27, 2005. Worker for Andersen Pollution Control rests during cleanup of oil spill at Valero facility in Port Arthur, Texas, September 27, 2005. Evacuees from New Orleans at the Astrodome in Houston. Approximately 4,000 evacuees remained housed in the Astrodome, down from more than 25,000 the first week.